It’s hard to believe but next May, Mark and I will celebrate not only our 20th wedding anniversary, but also 20 years of owning homes. 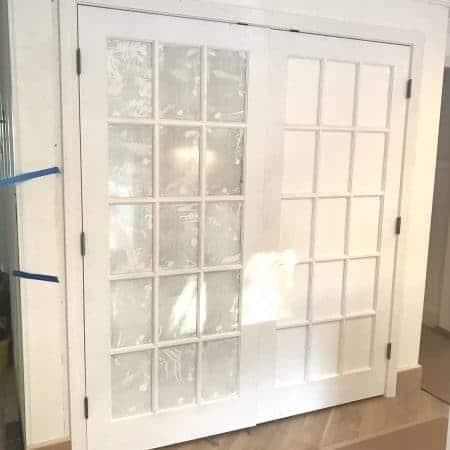 Some of our house-to-home projects we’ve hired out to professionals, but many, many of them we’ve tackled ourselves, especially in the last few years since we moved to our current diamond-in-the-rough. And you know how I love to have friends over here so you’ll be seeing a few other bloggers’ mishaps here and there too. We’ve all got a few regrets! This is where the every-time-I-vacuum-I-think-about-blogging comes into play. Our foyer stairs. OY VEY. Here they are at our inspection 6 years ago. 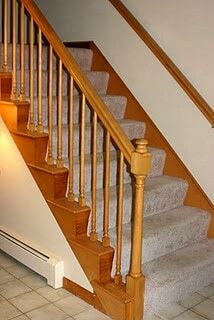 I ripped off the runner, pulled out all those stinkin’ staples, and painted the risers and spindles which made a huge difference. 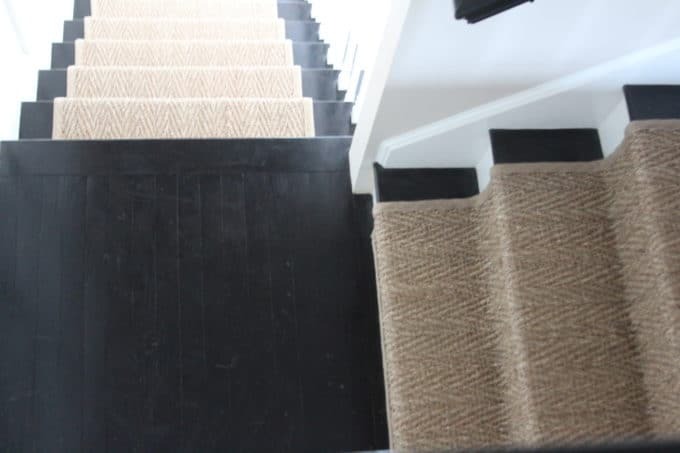 I had already stained the railings dark and we loved them, so I decided to go with a dark stain on the treads to disguise any discoloration, and OH WE LOVED THEM DARK!!!!! Oh my gosh, right from the start, they totally changed our boring, cookie cutter house!! The stairs were so dramatic and a little different than every other house on the block. Soon after, I installed board and batten to the foyer walls and although we still had our ugly 80s tile going on (and oh yes, the baloney countertops and old linoleum floors in the distance! 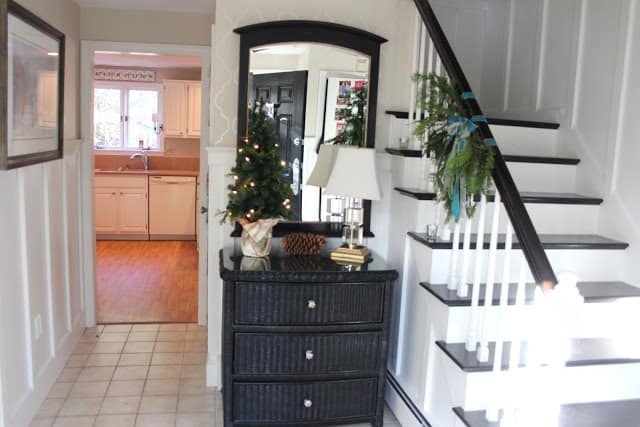 ), the foyer looked worlds better than were we started. Even though they were a contrast to our natural red oak floors I thought it all kind of worked. BUT THEN!!! It didn’t take long to realize the dark stairs were going to be high maintenance. They NEVER looked clean. Every bit of our dog’s fur had some kind of magnetic pull to the dark treads, despite the fact that he never ONCE went upstairs in this house (our big St. Bernard was terrified of stairs 🙂 ). BUT YOU GUYS. Our pup has been gone now for 2 and a half years and I’m not exaggerating when I tell you that still the stairs haunt me. I love them, and I despise them. I like a clean house like anyone else, but I don’t want to be a SLAVE to it. High maintenance, gah. 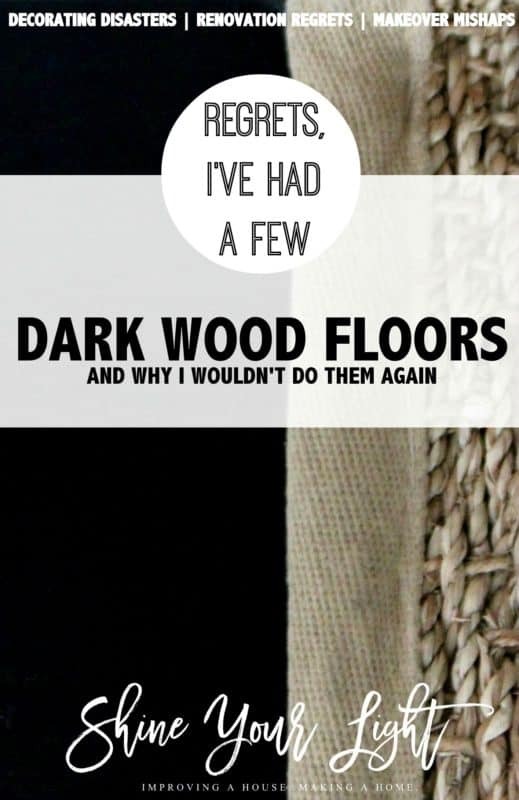 And I am oh so grateful that we didn’t do our floors yet, because this little lesson has taught me that I could never, ever live with a whole house of dark wood floors, whether they are ebony like my stairs or medium-dark stained like I talked about doing in this post. Do you have dark wood floors and if so, are they the bane of your existence or do you love them still? I HAVE NOT FAILED. I’VE JUST FOUND 10,000 WAYS THAT WON’T WORK! More disasters and mishaps to come because regrets…….I’ve got a few! Happy weekend my sweet friends!! Hope it will be free from stair dusting and full of fun!! It’s amazing home much we can learn from living with things for awhile. Since we have a golden retriever, I never even considered dark floors when we redid ours. We went with a medium stain but even with that, hair does show up! 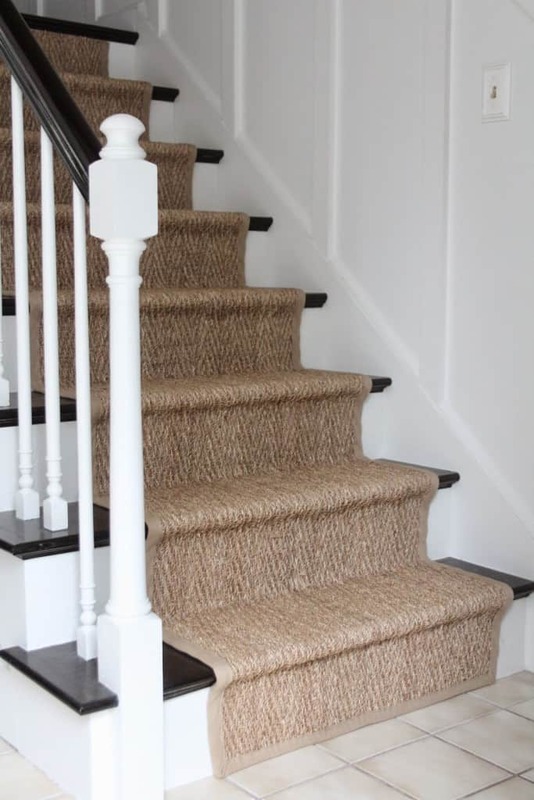 I am glad you are happy with your stair runner because it really is beautiful! 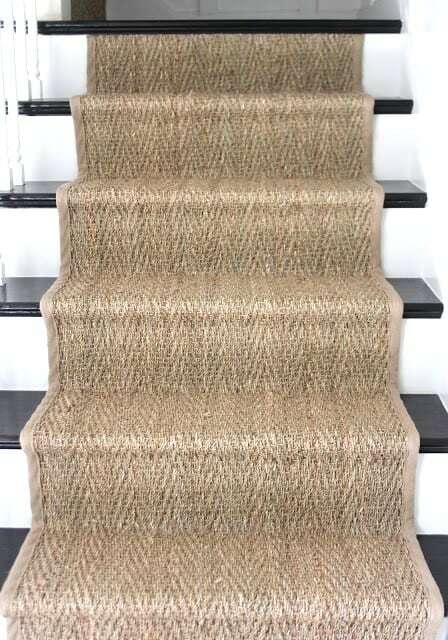 I chickened out and went for a synthetic sisal. We aren’t really fooling anyone but I needed a runner and that is the overall look I wanted! 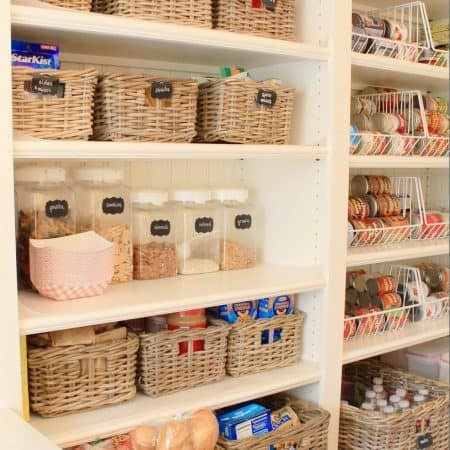 Now you have me thinking about other regrets I have in my home…I could really make a list! Enjoy your weekend! I love hearing about other bloggers’ experiences even though I hate to be a Debbie Downer about something so many people love! 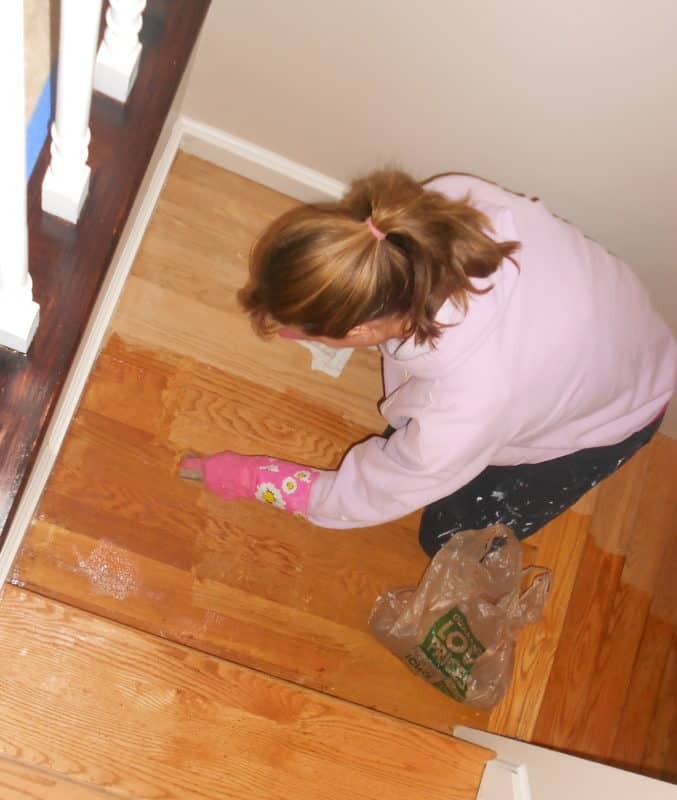 I love the stain you have in your house Shelley, I think I’ll go with something like that when we finally do our floors! Yes!!!! I to regret our dark floors 🙁 I always thought I wanted them and after years of homes with full carpet or orangey wood floors I did it. I love them within the first two hours of being clean and that’s about as long as they last being clean. The morning sun is the worst. It’s like it laughing at me showing me how much of a filthy human being I am 😀 Next time around, I’ll go light. I would have gone really dark in a heartbeat had I not had this experience with my stairs first Shelley! I love the look of them so much! But alas, there’s no room in my budget for a daily house cleaner so I’ll have to get over them. Your floors ARE such a gorgeous contrast to your light walls, so so pretty! Dark wood floors definitely look awesome, but you hit the nail on the head… they are super high maintenance! 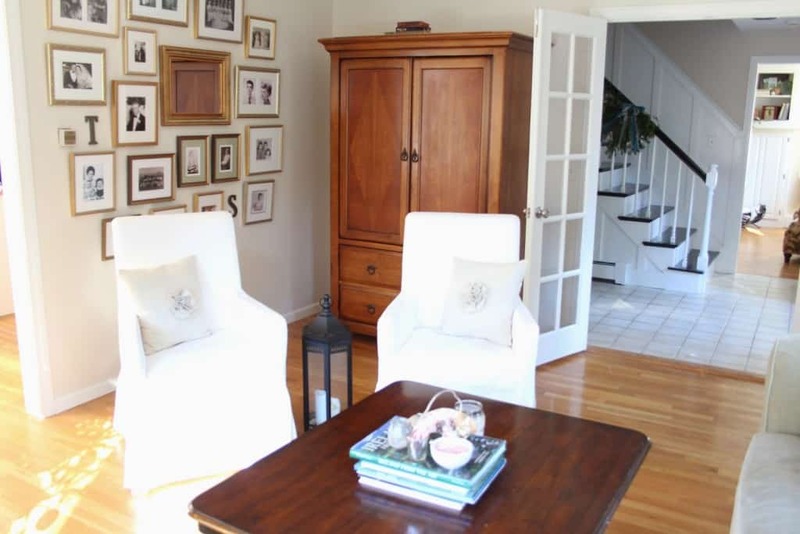 We had dark hardwood hickory floors in our last home (not quite as dark as yours), and they were a pain to maintain. Not only is dust/hair more quickly visible, but so are scratches. My husband was drawn to dark wood options for our current home when we were shopping for hardwood, and it took some persuasion on my part to steer him to lighter/medium brown tones. We couldn’t be happier. 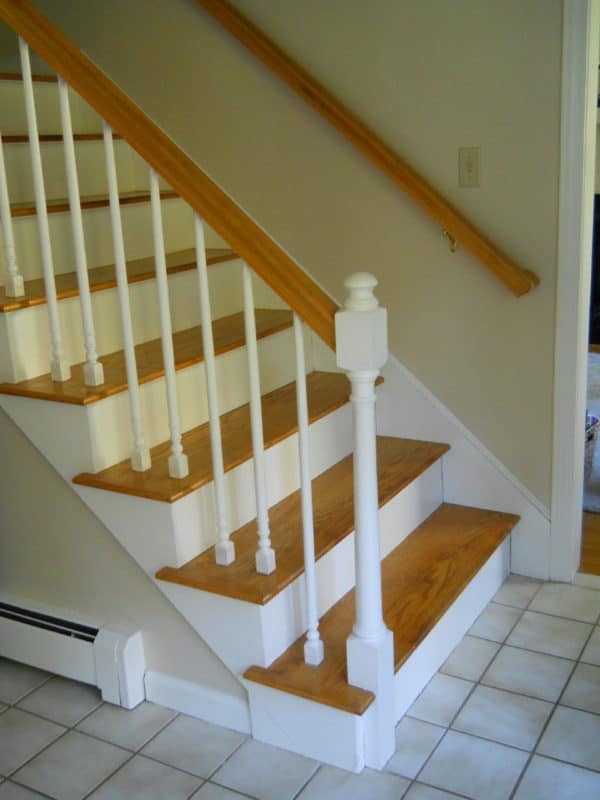 Your stairwell looks awesome though! Carol I am drawn to the dark floors too but I need low-maintenance for this house! I love your floors and will surely be needing your input when it’s time for us to finally do ours! Yes I made the same mistake…I absolutely adore them when they are clean…but oh do t hey show the Beau hair!! Good to warn your readers! I had dark floors once. ONCE! And just like you even adding rugs and not even having a pet around (or kids) it was daily cleaning…way too much drama for me! 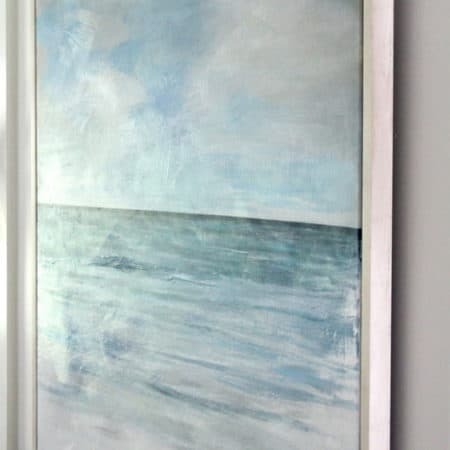 At our former home we had installed rustic red oak hardwood which I loved mainly for the fact that not much showed on it…until the sun hit it. In our current house, due to budget constraints and new country living (“dirt”), we installed Pergo Max flooring in Oakwood and OH EM GEE it’s the best! Thanks for the great post! I will have to check out that Pergo color Steph! Thank you for the recommendation!! I hear yah Lisa! I hate that I see every speck of dust on our floors too, thank God for our iRobot which cleans them up every night! I still do love the rich color it gives my home, so in the end, I would still do them dark,,,, although white and light seems nice too! Oh your floors are so gorgeous Vel. I love how they contrast your walls and are such a beautiful backdrop. Maybe I need the iRobot!!! Oh no! 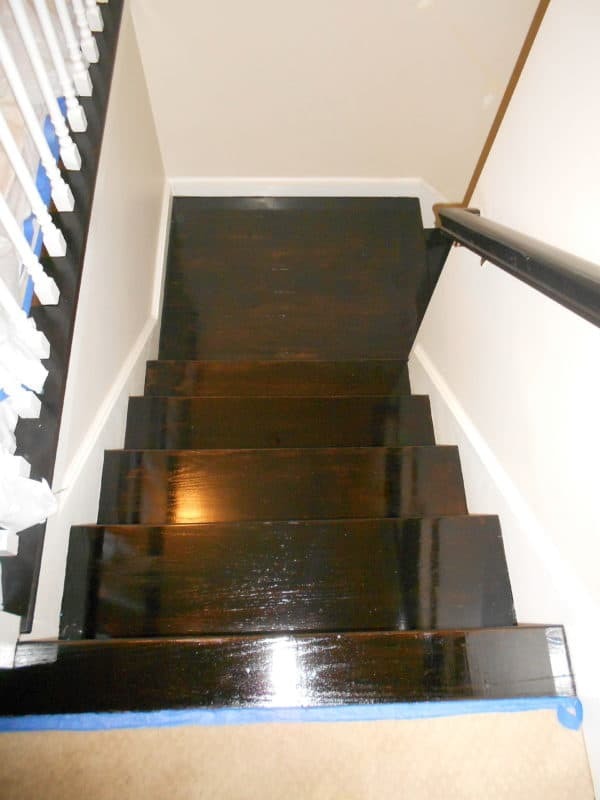 I just read this post and my floors were finished this week – in ebony stain! AHHHHHH! Oh I bet they are gorgeous though!! This is all about my complete lack of housekeeping abilities – I’m just coming to terms with the fact that I can’t deal with anything that needs any attention around my house 🙂 I can’t wait to see your floors! I struggled for months about whether to have our floors stained dark, light, or somewhere in the middle. We chose Minwax Provential, and it is a great medium color for our four sons,one shedding dog home! 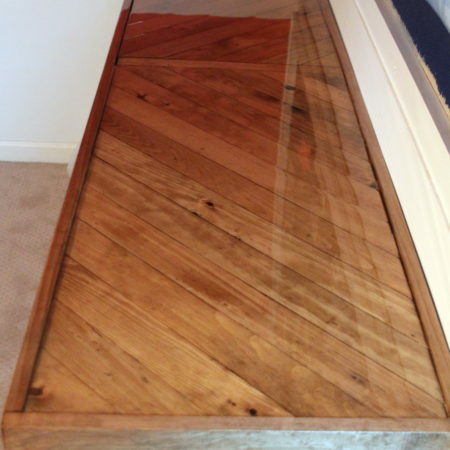 Thank you for the recommendation….I have that stain in my garage and will have to try it on red oak!